Abstract: In this seminar, Prof. Erhan Budak will talk about Taylor Medal as the recipient of this award in 2003. He received the medal at the CIRP General Assembly in August 2003 as the first and the only researcher from Turkey in CIRP's history, still to date. Every year, International Institution for Production Engineering Research, or CIRP (College International pour l'Etude Scientifique des Techniques de Production Mecanique-) based in Paris, awards the Taylor Medal to an individual for his/her contributions to production engineering research and development. The medal is named after Frederick W. Taylor (1856-1915) who was a pioneer in production engineering. CIRP, an international organization with about 500 members representing over 40 countries, was founded in 1951 after it was realized that the development of new production techniques was not possible without scientific methods. Nominations for Taylor Medal are evaluated by a CIRP committee with a detailed reviewing process, and the final decision has to be approved by at least two-thirds of the active members. Dr. Budak was awarded the medal based on his research in multi-axis milling processes applied to manufacturing of jet engine parts. 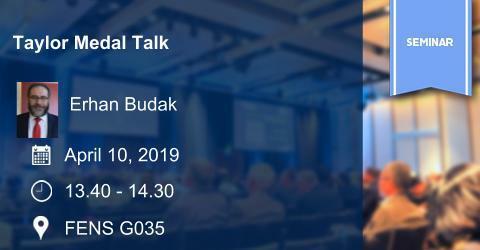 The talk will also include some details on his research in milling process mechanics and dynamics implemented in machining of titanium based jet engine compressors and impellers. BIO: After receiving B.Sc. (1987) and M.Sc. (1989) from the Middle East Technical University, Dr. Budak completed his Ph.D. at the University of British Columbia in 1994 in Manufacturing Automation Lab. He then worked for Pratt & Whitney Canada as manufacturing development engineer until 2000 focusing on turbine engine manufacturing. He joined Sabanci University as a faculty member in 2000 and founded Manufacturing Research Lab (//labs.sabanciuniv.edu/mrl/). In 2003, he was awarded the Taylor Medal by CIRP (www.cirp.net) for his work on high performance multi-axis machining of turbine compressors. He is the founder of a spin-off company, Maxima Manufacturing R&D, which develops and implements machining solutions for various industries. He has authored/co-authored more than 200 articles and papers in conference proceedings receiving more than 8000 citations with h-index of 45 (Google Scholar). He is a fellow of CIRP (currently Chair of STC-M), associate/regional editor and editorial board member of several journals. His areas of interest include machining processes and machine tools, intelligent manufacturing, process modeling, high precision/ performance manufacturing and machine dynamics. Recently, Dr. Budak received Mustafa Parlar “Science Award” (December 2018) based on his contributions to the machining research.